This page contains the UK’s only comprehensive and regularly updated guide to credit and charge cards offering air miles or hotel loyalty points. This page was correct as at 16th April. See the main site for any new promotions. American Express changed its sign-up bonus rules on 21st March 2019 and adjusted some bonuses on 15th April and those changes are reflected below. I know that there is a lot of information here! I summarise the top deals below. For extra guidance, this article compares all 12 (!) of the credit cards which earn Avios points. I also recommend this article on the best travel credit cards for long-term spending. This article looks at which cards are worth keeping for their benefits, even if you never use them. This article ranks all of the airline and hotel cards in terms of the most valuable sign-up bonuses, adjusting for fees. I am happy to refer readers for the special referral bonuses on the British Airways, Starwood (Marriott), American Express Platinum and American Express Preferred Rewards Gold cards. Please e-mail me at rob [at] headforpoints.co.uk with the name of the card for which you would like a referral. If you want a reward card for your small business, there is a separate section at the bottom of this page. All of these cards carry a 3% foreign exchange fee when used abroad. If you want a dedicated credit card to use abroad, take a look at the Virgin Money Travel Credit Card (click here). Whilst it doesn’t earn miles, this card is free and charges NO foreign exchange fees. It also offers 0% interest on purchases for 12 months and 0% interest on balance transfers for 12 months, with no fee. Representative APR 19.9% variable. This is the most generous card which has no fee in Year 1. You receive 10,000 Membership Rewards points (see here for what 10,000 Membership Rewards points can get you – 10,000 Avios points for example!) You can earn an extra 2,000 points if I refer you, see below. My full review of American Express Gold is here. The card offers 30,000 Membership Rewards points, worth 30,000 Avios or 30,000 Virgin Flying Club miles amongst other things. You earn an extra 5,000 points if I refer you – see below for details. You receive a pro-rata refund on the £450 fee when you cancel the card and you will retain most of the benefits – Marriott Gold, Radisson Gold, Hilton Gold, Melia Gold, Shangri-La Jade, Eurostar lounge access – for the rest of the year even after you cancel. My full review of American Express Platinum is here. The sign-up bonus on the premium BA card is 25,000 Avios points. You earn an extra 1,000 Avios if I refer you – see below for details. My full review of the British Airways Premium Plus card is here. These are the most generous Mastercard or Visa cards for day to day spending. The free Reward card (with a 5,000 miles sign-up bonus) earns 0.75 miles per £1 whilst the annual fee Reward+ card (with a 15,000 mile sign-up bonus) earns 1.5 miles per £1. Sign-up bonus: The standard offer is 10,000 Membership Rewards points (= 10,000 Avios etc) when you spend £3,000 in the first three months. A higher bonus of 12,000 Membership Rewards points (= 12,000 Avios) is available if you are referred by an existing cardholder. Please e-mail me at rob [at] headforpoints.co.uk if you would like a referral. On-going benefits: Double points on all airline and foreign spend, triple points on all spend on the Amex Travel website, 10% Hertz discount, $75 in-hotel credit with 350 selected hotels worldwide, two free airport lounge passes each year. You receive an annual bonus of 10,000 bonus Membership Rewards points if you spent £15,000 in the previous year. Representative APR 57.6% variable including the annual fee (free in year 1) based on a notional £1,200 credit limit. Interest rate on purchases 22.9% APR variable. Sign-up bonus: The standard offer is 30,000 Membership Rewards points (= 30,000 Avios etc) when you spend £2,000 in the first three months. A higher bonus of 35,000 Membership Rewards points (= 35,000 Avios) is available if you are referred by an existing cardholder. Please e-mail me at rob [at] headforpoints.co.uk if you would like a referral. The bonus is only available to customers who have not held a Platinum, Gold, Green or American Express Rewards Amex card in the previous 24 months. Note that this is a charge card and your balance must be cleared in full each month. On-going benefits: Marriott Bonvoy Gold, Radisson Rewards Gold Elite, Hilton Honors Gold, Shangri-La Golden Circle Jade status, Melia Reward Gold, two Priority Pass cards for airport lounge access, Eurostar lounge access, Delta lounge access, travel insurance for your family and the family of up to five supplementary cardholders, subject to enrolment. Sign-up bonus: There are three versions of this card: LOW RATE (click here) – 2,500 Membership Rewards points bonus after spending £1,000 and a representative APR of 9.9% variable or BASIC (click here) – 5,000 Membership Rewards points bonus after spending £2,000 and a representative APR of 22.9% variable or PURCHASES (click here) – NO sign-up bonus but 0% APR on purchases for 18 months and a representative APR of 22.9% variable beyond that. This is not the best Amex starter card – you should get Preferred Rewards Gold instead because of the higher bonus and better benefits. You should get Amex Rewards if you are planning to cancel a Gold or Platinum card but want to keep your Membership Rewards points. I explain more in this article. Sign-up bonus: 5,000 Avios points when you spend £1,000 within 3 months. A higher bonus of 6,000 Avios points is available if you are referred by an existing cardholder. Please e-mail me at rob [at] headforpoints.co.uk if you would like a referral. On-going benefits: Free companion voucher for an Avios redemption when you spend £20,000 each year. The voucher is valid for one year, taxes still apply. Representative APR 22.9% variable. Sign-up bonus: 25,000 Avios points when you spend £3,000 within 3 months. A higher bonus of 26,000 Avios points is available if you are referred by an existing cardholder. Please e-mail me at rob [at] headforpoints.co.uk if you would like a referral. The bonus is only available to customers who have not held a British Airways or British Airways Premium Plus Amex card in the previous 24 months. On-going benefits: Free companion voucher for an Avios redemption when you spend £10,000 each year. The voucher is valid for two years, taxes still apply. Double miles on BA flights and holidays booked at ba.com. Representative APR 76.0% variable including £195 fee based on a notional £1200 credit limit. Interest rate on purchases 22.9% variable. On-going benefits: Free 2-4-1 voucher for a miles redemption when you spend £20,000 each year. This is valid in Economy for base members, Premium for Silver members and Upper for Gold. The voucher is valid for two years, taxes still apply. The voucher can be swapped for an ‘Economy to Premium’ upgrade voucher for a miles ticket. 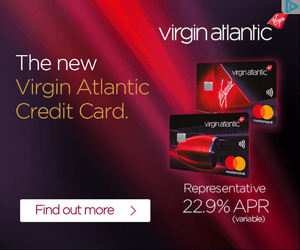 Double miles on online or call centre bookings with Virgin Atlantic and Virgin Holidays and unlimited free access to Virgin Money lounges across the UK. Representative APR 22.9% variable. On-going benefits: Free 2-4-1 voucher for a miles redemption when you spend £10,000 each year. This is valid in Economy for base members, Premium for Silver members and Upper for Gold. The voucher is valid for two years, taxes still apply. The voucher can be swapped for an ‘Economy to Premium’ upgrade voucher for a miles ticket. Double miles on online or call centre bookings with Virgin Atlantic and Virgin Holidays and unlimited free access to Virgin Money lounges across the UK. Representative APR 63.9% variable including £160 fee based on a notional £1200 credit limit. Interest rate on purchases 22.9% variable. Sign-up bonus: 5,000 Lufthansa Miles & More miles, triggered with your first purchase. You receive two cards – a Diners Club card and a Mastercard – but only one combined statement. Both cards earn at the same rate. Note that this is a charge card and your balance must be cleared in full each month. On-going benefits: Spending £1+ per month on this card will stop your Miles & More balance from expiring. You can access 800 airport lounges for £15 per visit. On-going benefits: Double points on spending at IHG Rewards Club hotels and abroad, IHG Rewards Club Gold status. Representative APR 18.9% variable. On-going benefits: Voucher for a free night at any IHG Rewards Club property when you spend £10,000 per year, double points on spending at IHG Rewards Club hotels, double points on foreign spend, IHG Rewards Club Platinum status. Representative APR 41.5% variable including fee based on a notional £1200 credit limit. Sign-up bonus: 30,000 Marriott Bonvoy points when you spend £1,000 within the first three months. This is convertible into 10,000 Avios or 40+ other airline schemes. A higher bonus of 33,000 Marriott Bonvoy points is available if you are referred by an existing cardholder. Please e-mail me at rob [at] headforpoints.co.uk if you would like a referral. Pro-rata fee refund received when card is cancelled. On-going benefits: Voucher for a free night in any property costing up to 25,000 points when you spend £25,000 per year. Upgrade to Marriott Bonvoy Gold status when you spend £15,000 in a card year. Double points on Marriott hotel stays until December 2019. Representative APR 39.7% variable including fee based on a notional £1200 credit limit. Sign-up bonus: None at present. Note that this card is only available to HSBC Premier current account holders, and that a substantial financial commitment to HSBC is required to receive one. Representative APR 18.9% variable. Sign-up bonus: 40,000 HSBC points (=20,000 miles) for spending £2,000 within three months and a further 40,000 HSBC points (=20,000 miles) for spending £12,000 within twelve months, paid at the year end. Other benefits include airport lounge access. Note that this card is only available to HSBC Premier current account holders, and that a substantial financial commitment to HSBC is required to receive one. Representative APR 59.3% variable including fee based on a notional £1200 credit limit. Sign-up bonus: None at present. The earning rate of 1 Clubcard point per £8 spent is equivalent to 0.3 Avios points per £1 or 0.312 Virgin Flying Club miles per £1. Representative APR 19.9% variable based on the ‘Purchases’ version of the card. The Tesco card is the highest paying Visa / Mastercard on the market if you want to earn Avios unless you meet the stringent requirements for HSBC Premier. Head for Points focusses primarily on personal cards. However, if you are a sole trader or run a small business, your options are the American Express Platinum Business card and the American Express Gold Business card. There is currently a 20,000 points (= 20,000 Avios) bonus on the Gold Business card and a 40,000 points (40,000 Avios) bonus on the Platinum Business card. The Platinum Business card offers different benefits to the standard Platinum card. The travel insurance is better, as the age limit is increased to 80 and there is no requirement to pay for your flight or hotel with an Amex card. The hotel status and Priority Pass benefits are also slightly different. The sign-up bonuses are only available to customers who have not held a personal or business Green, Gold or Platinum American Express card, or an American Express Rewards credit card, in the previous six months. By recommending credit cards on this site, I am – technically – acting as a credit broker. Robert Burgess, trading as Head for Points, is regulated and authorised by the Financial Conduct Authority to act as a credit broker.